Brazil’s national debt is expected to surpass 87% of the GDP in 2018; where do the people’s resources go? Under the Michel Temer administration, Brazil’s public debt increased by 1.51% in March, surpassing R$3.6 trillion (around US$973 billion), according to official data. Certain approaches to macro-economic policy suggest that during periods of national debt, governments should consider increasing levels of public investment through financing infrastructure projects and social welfare programs that help generate employment, increase individual spending in order to restimulate the economy. However, according to retired auditor of Brazil’s Internal Revenue Service (Receita Federal do Brasil – RFB) and founder of the Brazilian Citizens’ Debt Audit (Auditoria Cidadã da Dívida) Maria Lúcia Fattorelli, in Brazil, national debt has not been used as a mechanism for public investment. Instead, a series of macro-prudential economic policies have been implemented as a tool for rentier interests. In other words, the government has been issuing treasury bonds to pay the interests on government debt rather than selling treasury bonds in order to finance health, education, and infrastructure programs. Pochmann points out how similar Brazil’s current economic policy, which favors rentiers, is comparable to the country's neoliberal years in the 1990s, during Fernando Henrique Cardoso’s administration (1995-2002), when public debt exceeded 70% of the country’s total GDP. “What happened in the 1990s, especially during Cardoso’s government, is similar to what we started to witness since 2016, which is exactly the rhetoric of fighting public expenditures or ‘waste.’ That is, they treat it as if it were a fiscal austerity issue. In the 1990s, we witnessed widespread privatization, the auctioning off of lucrative national assets, regressive tax increases and major cuts to public spending,” he added. Fattorelli argues that these regressive economic policies are part of a broader strategy to introduce unpopular measures, such as privatization and the elimination of basic rights. But, ultimately, who is the primary benefactor from government debt? 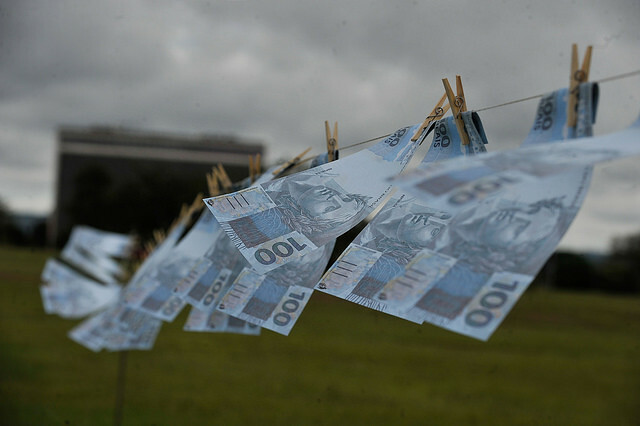 Fattorelli explains that creditor data is confidential in Brazil, which he argues is a violation of the country’s Constitution since Brazilian law requires a criterion of transparency in order for the government to carry out financial operations. “We only know banks make up half of the public debt. National and foreign investment funds and pension funds, each has around 18%. Tesouro Direto [a program that allows individuals to purchase public bonds through the internet], which is what any of us can buy, has less than 1% of debt owners. So most of it is with banks,” she explains. Fattorelli advocates that citizens should audit the public debt in order to identify illegally issued bonds and discrepancies between tax revenue and the payment of interests on debt. According to the International Monetary Fund (IMF), Brazil’s public debt is expected to surpass 87% of the country’s GDP in 2018, one of the highest public debt levels in Latin America.